SHR stands for Super Hair Removal, a technology for permanent hair removal which is having a sweeping success. The system combines laser technology and the benefits of the pulsating light method achieving practically painless results. 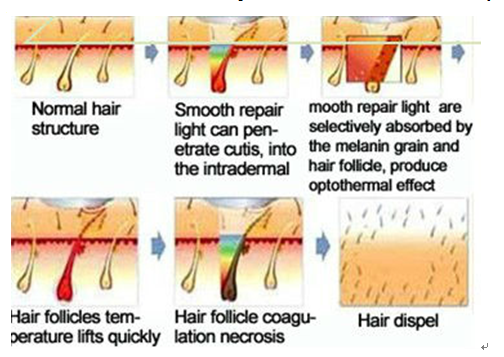 Even hairs which until now have been difficult or even impossible to be removed, can now be treated. “In Motion” represents a breakthrough in permanent hair removal with light technology. The treatment is more pleasant than with the conventional systems and your skin is better protected. Work Mode Multi pulse mode Single pulse mode Single pulse mode can emit energy averagely, however, multi-pulse mode focus energy on first pulse, which is very easy to burn patients. Wavelength 640-1200nm 640-950nm SHR(OPT) filtered violet light and infrared light, which will eradiate and absorb water from target skin. So SHR does not have any side-effect to body. Identified handpiece Available Available Idenfitied function makes operation simple, and makes treatment safely! DEC Technology Unavailable Unavailable Make sure energy output accurate and same with the display all the time, which makes operation easy and safe. 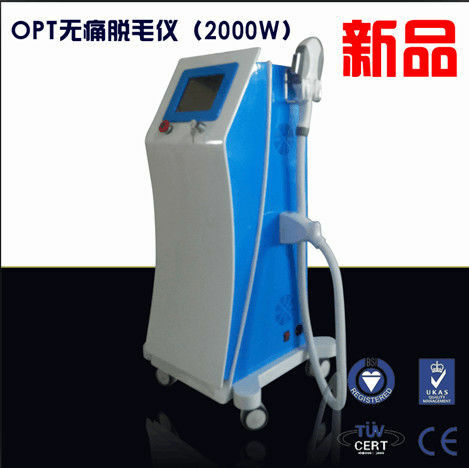 Frequency 0.2-1Hz 1-10Hz Which accelerate operation speed and short a lot of time for treatment! Work technology Stationary technology Stationary technology & In-motion technology “Moving IPL” can use less time to do treatment on back, leg and arm.